Get a moisture barrier and crack suppression underlayment all in one with TraxxShield 100 Rolled Moisture Barrier™. This rolled moisture barrier suppresses water vapor emissions from concrete subfloors up to 100% relative humidity, suppresses pH of 14, and provides acoustical benefits. It stops alkalinity, emulsifying of adhesive, mold/mildew, and most flooring damage from moisture. Great for protecting against moisture and vapor damage under: carpet tile, broadloom carpet, vinyl composite tile, luxury vinyl tile and planks, ceramic tile, commercial-grade sheet tile, radiant flooring systems and more. Can be installed using the peel-and-stick method or loose-lay method. Saves money, labor, and time over other epoxy systems. Use the TraxxShield™ Primer and Traxxshield™ Seam Tapes to complete your installation. Proprietary fabric design of the top layer of the TraxxShield100™ is unique in both blocking moisture vapor emission from the slab upward and blocking plasticizer migration from the subflooring downward. Top fabric layer provides an excellent bonding surface for applying the floorcovering adhesives Install a wide variety of flooring over TraxxShield100™ including: carpet tile, broadloom carpet, vinyl composite tile, luxury vinyl tile and planks, ceramic tile, most commercial-grade sheet tile, radiant flooring systems and more. 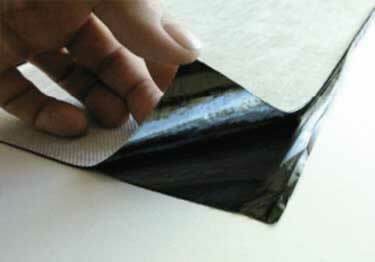 Peel-and-Stick Installation Method: Quick and easy installation, requires no curing time, no fumes, no dust, no VOCs. No telegraphing seams. Adheres to the concrete slab. Provides a secured flooring system the almost completely eliminates the effects for "rolling loads". Loose-Lay Installation Method: Installs easily over existing hard surface floor coverings. Perfect for planning future floor removal. Saves time and money - no downtime. Finished flooring can be laid immediately after TraxxShield100™ is installed. Anti-Facture Properties - provides strength and flexibility to bridge horizontal cracks up to 3/8" without transferring stress load to the finished tile topping - great for ceramic tile! No growth of mold or fungus as tested per ASTM D3273. TraxxShield™ Primer: Designed for use on porous and non-porous concrete surfaces. Always prime the concrete before installation. Available in one gallon and 5 gallon containers. Get a moisture barrier and crack suppression underlayment all in one with TraxxShield 100 Rolled Moisture Barrier™. This rolled moisture barrier suppresses water vapor emissions from concrete subfloors up to 100% relative humidity, suppresses pH of 14, and provides acoustical benefits.